← Why Do Men Fail To Trust Women? 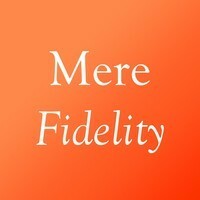 This week’s Mere Fidelity podcast is on the subject of the cross in the gospel. Derek, Matt, Andrew, and I discuss the question of whether the gospels have a doctrine of the atonement and, if they do, what it looks like. Take a listen and share your thoughts in the comments! This entry was posted in NT, NT Theology, Podcasts, The Atonement, The Gospels. Bookmark the permalink. I completely agree with Matt at minute 24. I love listening to all of you elaborate on the glory and greatness of Christ. He is so high, and yet he stooped so low, so perfect without a grain of pride… and he died. He shouldn’t have had to do that, but we needed him to, so he did, we didn’t even know we needed it. I remember long seasons in high school and college when the gospel felt too familiar, it was stale to me. I always clung to the fact of the resurrection when doubts assailed my mind and my heart felt cold. But it is a wonderful thing indeed to weep for the beauty of Christ crucified. I was really pleased that we chose this particular subject for the episode. I was reflecting upon some of the themes that had come up within it for quite some time afterwards. Christ’s sacrifice really does become more amazing the longer that you think about it! The logic vs narrative discussion (still wrapping my head around it) confronts evangelicals at the foundation of our way of processing the gospel, and shines a light on the path we need to return to in order to proclaim Christ, in America at least. Increasingly, I see reference to narrative being the way liberals (political and religious) convey their ideas. Conservatives complain that liberals are using narrative to trump facts and logic to “convey a deeper truth.” In their complaints, they completely miss the fact that narrative is how humans learn, and that therefore narrative has power. They miss an opportunity to tell a better narrative, one that both fits the facts and points to an even higher truth. Evangelicals can get so stuck on apologetics and the Romans Road, condemning the masses for not being logical. And then they go home and read stories to their kids before bedtime. Sorry, I’m ranting now. This is a major paradigm shift for me. I am guilty of this way of thinking. I have a one year old daughter, she needs stories. Like that Chesterton quote about knowing dragons can be defeated. I keep meeting people who are open to spiritual things but don’t want specifics. They are living with a weak and small narrative, and they need to know they can be part of the grandest narrative in all of history. I told my pastor recently, we need to talk about what Jesus is doing today. We know he is alive because he is still at work today. The pinnacle of history still impacts us today, which is how we know it was the pinnacle. In my small group were going through Ephesians. My Grandfather who got his PhD by focusing on Paul’s literature emphasizes that as a Jew, Paul describes things as they happened, without needing to reference a larger theory, of sovereignty for example, to conform the events to. I told you I was still wrapping my head around this. Thanks for the comment, Bethany. 1. It democratizes theology, as everyone has a story and everyone’s story must be taken seriously. Limiting the theological conversation to a trained academic elite is illegitimate and should be resisted. Their voices are not more valid than those of others. 2. It privatizes truth. Public criteria for truth are displaced by the emphasis upon the importance of our personal stories and the criteria that they place upon truth. 3. It makes public interpretation and discourse about truth difficult, especially in disputational forms as interpretation is regarded as a projection of a person’s personal story and arguing for one particular interpretation against others can be seen as a form of oppression and a power move. Pervasive interpretative pluralism is often regarded as a positive reality, because it ensures that no one story dominates over everyone else’s. As people’s identities are closely aligned with their interpretations, it is difficult to challenge the ideas without being seen to be attacking the person. People’s sensitivities intrude much more in theological discourse as a result. It is very difficult to argue about personal stories. The focus becomes upon the sharing of stories, people emotionally resonating with other people’s stories, and the like. 4. It encourages hyper-contextualism, a hermeneutic of suspicion, and a subjectivist approach to interpretation. I’ve argued at length with some people that feminist, black, or queer theologies, and other theologies that relate Christian truth to a particular vantage point of identity—to our personal stories—are not a straightforward counterpart to traditional—supposedly ‘white cishet male’—theologies. Many were appalled by my claim that, while theology is always coloured by the identities of those doing it, it is not simply determined by those identities, and most theology is not heavily conditioned by our identities at all. Rather, the practice of theology frequently calls us beyond the constraints of the immediate horizons of our identities in many respects. The understanding of truth in the mode of personal story leads to extreme suspicion towards those who challenge other people’s stories, as this is obviously a power claim. The subjectivist approach to interpretation is seen in a focus on how texts ‘feel’ to the reader. 5. It focuses the communication of Christian truth upon the sharing of personal narrative. Valuable as it can be, telling personal narratives about why we continue to follow Jesus is, of course, rather different from telling a story that greatly exceeds, calls into question, and relativizes our own. The ‘truth’ that often seems to be in view here is a truth that applies to me and might resonate with you, rather than a truth that is true for all of us. The clergy are no longer so much those especially entrusted with upholding and communicating God’s truth, but those who communicate their own truths in a liberating manner. All of this said, I think that we need a greater emphasis upon narrative. We just need to be aware of some of the pitfalls that lie in this area. I’ve argued at length with some people that feminist, black, or queer theologies, and other theologies that relate Christian truth to a particular vantage point of identity—to our personal stories—are not a straightforward counterpart to traditional—supposedly ‘white cishet male’—theologies. I’m not qualified to have a position on either side of the dispute, but it may be instructive and helpful to compare the differences between traditional Christian theology/halakkah/aggadah and traditional Jewish theology/halakkah/aggadah, with the differences between traditional theology and black/feminist/queer etc. theologies. How did belonging to the different communities shape a person’s readings of Scripture, the questions they brought to the text, the methods they used to read Scripture, and the goals the seek from Scripture study; and how is the communities’ shaping of the interpretative traditions different from/similar to how they are shaped today. I don’t know what that line of inquiry would reveal, but it may nevertheless prove fruitful. 1. The distinction between readings coloured by our identities and readings that centre those identities. 2. The distinction between community and identity grouping. Regarding your first point: I’m not sure that it would be accurate to call Judaism or Christianity “identities”–or at the best, such language would describe only a part of how persons relate to the trans-generational people, a people that by teaching them a mother tongue is mother to each member, in directing liturgical gestures directs the sorts of gestures the members will use to take up the workd, and through liturgical acts of remembrance shapes each person’s memories, and which gives to the members a hope for the future, and in whose continued existence the person grounds their hope for survival, and for their children’s survival (to leave aside the question of the community’s relation to God–that is, to attempt to describe the Church without reference to the Body of Christ, and the Jewish people without reference to the Shemah or the Torah, or God’s Tefillin, or…, two laughable tasks)–but inasmuch as the members of the peoples are reading the Scripture, I should hope that the people more than “colors” the readings, but that indeed, the reading exists only in and for the people, and is centered in that people. It is, after all, the people, in its liturgies and language that teaches the members to read at all, and it is, as it were, in and from the community (this is too weak a term: Is the Bride of Christ a “community“? Does God inscribe the name of a “community” on His teffilin?) that the person lives and moves and has his being; and, in a very real sense, in and through the God who has chosen the people, and loves the people as a unique people, the people is the center. But that, I think, relates to your second point. Anyway, I’m not sure what such a comparison would reveal, and I doubt there are any people well enough versed in the Talmud and the Christian interpretative tradition to make any substantive comparison. But nevertheless, I think it would be a fruitful line of inquiry. Yes, I wouldn’t describe Judaism or Christianity as ‘identities’. I agree with the sort of points that you are making. However, I think that our comments are focused upon rather different things. I am focusing upon the modern phenomena of ‘contextual’ readings that focus upon particular ‘identities’, whereas you are focusing more upon the way in which the covenant people and the covenant Scriptures are inseparably bound together. Much of my PhD work argued for the importance of this connection, so I am definitely not going to dispute it here. That said, this is a rather different thing from the sort of readings advanced by feminist/black/queer readers of Scripture. I suspect you are correct, though I am not sufficiently familiar with the various sorts of theology to have a strong opinion. I’ve read all the comments on this thread with interest, but I have yet to listen to the podcast! I just want to say a couple of things. I think there is a difference between narratives and testimonies. A narrative, as I understand it, puts the narrator at the centre of the story, while also giving God some mentions. A testimony does the opposite and puts God at the centre, while inevitably making some reference to the speaker’s/ writer’s own life. I like hearing testimonies about the way God is working in peoples’ lives. We heard an amazing testimony at our church a few weeks ago from a family who recently converted to Christianity from another faith. Having converted to Christianity, they now come to our church regularly and look to our leaders for guidance and discipling, and to all of us for encouragement. You’re onto something with your distinction, esp how those words are used in a popular context. Within your framework, we can still describe the gospel as narrative because it is God’s story. I think we also must be aware that those who base their understanding of truth on personal experience will not see the distinction that you make. I have seen all that you describe in action, though I hadn’t articulated it. My dad, who I love and respect, and is to me a giant in faith and evangelism, has said in the past “They can’t argue with your story.” But he said so not quite appreciating the fact that it works both ways. My experience with the abuse of personal narrative, combined with my love for reason (per our twitter conversation) led me to discount narrative as a way of knowing, or at least as a way of evangelizing, and sometimes even of understanding the gospel. It’s funny though. I once had a conversation with a more liberal Christian friend, who was challenging me as an evangelical, saying that the gospel is hard to define (implying that many people define it according to their own self interest). When I told him I define the gospel as the story of Jesus (incarnation, death, resurrection and everything in between), he didn’t dispute me anymore. So on one level I got it, and on another level, I rejected narrative as a valuable system for communication. All this processing (verbal processor that I am) leads me to say that the narrative of the cross is the supreme narrative, and related to personal testimony as cause to effect. God has fitted humanity for narrative, and fitted the gospel as narrative for humanity. As we share the gospel, even as we preach it to ourselves, we must be aware of the fact that an understanding of truth (accurate or not), sinks in very deeply in narrative form. We must be careful not to underestimate on the one hand, or abuse on the other, this power. Yes, narrative is hugely important, even personal narrative. Far too important and powerful to be handled carelessly. The problem is not personal narrative but the abuse of it. By the way, on the subject of testimonies, you might find this post thought-provoking. I’ve listened to the podcast now. What Alastair said, beginning with John16:21, was full of truth and light.